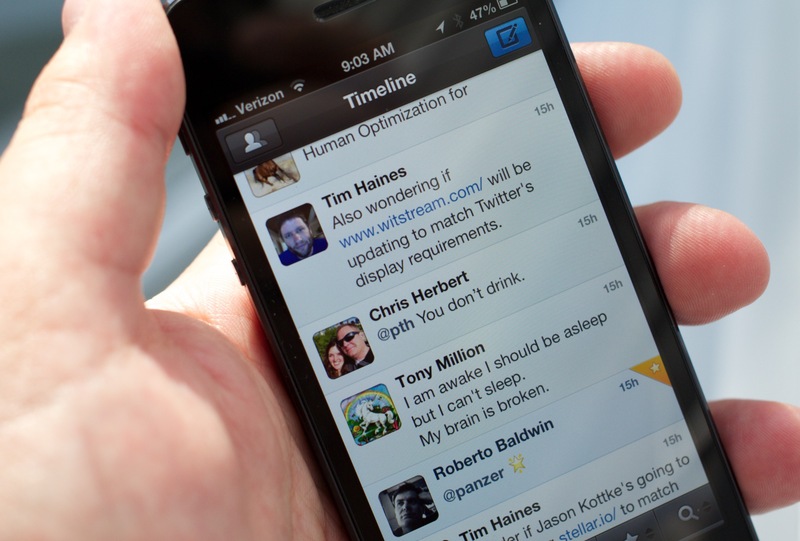 Tapbots, the studio behind the popular Tweetbot client for Twitter, has brought its design prowess to the fledgeling communication platform App.net. The company’s new app Netbot serves users with the same visual panache and sure hand that it has brought to its Twitter client and to a half-dozen other robot-themed apps. We’ve taken a look at several other clients for App.net recently that have a unique feel, like Rivr for iPhone and Hooha for Android. But Netbot’s familiarity to many Twitter users, along with its general level of polish, make it an instant contender for the best App.net client for a lot of people. App.net, for the unfamiliar, is a communication platform that — at least for now — works a lot like Twitter does. There is a global stream of messages that offers a look at the messages coming from all 20,000+ current users as well as a personal feed of just the people you follow. Over the past few weeks, App.net’s engineers, led by founder Dalton Caldwell, have been implementing many of the features that Twitter users have come to enjoy from a real-time web platform. 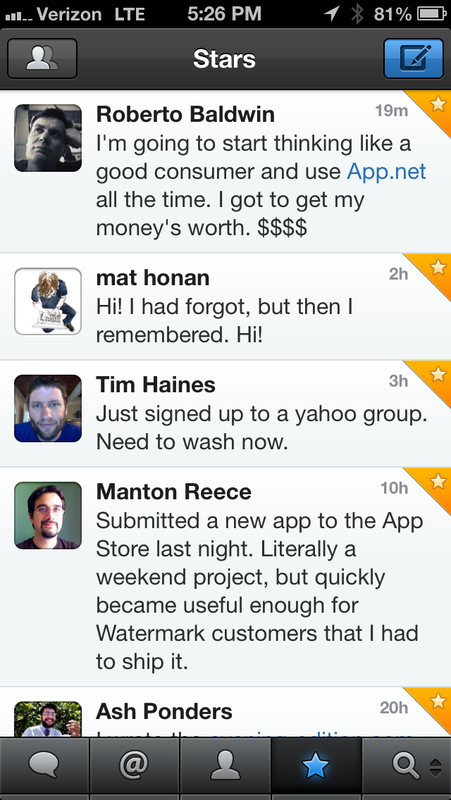 These included Replies, Mentions, Reposts (retweets), Stars (favorites), conversations and more. Netbot has gained support for each of these as they’ve become available in the API, which is evolving rapidly. Thankfully, Tapbots has shown a progressive attitude towards getting them in the app and getting them working right, at least over the course of my time testing it. And, given their continuous support of the Twitter ecosystem over the years, buying into Netbot is unlikely to be a bad decision if you want to continue to be able to take advantages of the latest and greatest App.net features down the road. If you look at the bottom of the profile page, you’ll also see a little easter-eggy thing that tells you which # user of App.net a person is and when they joined the alpha. I believe that #18 is the earliest non-employee. Another nice visual touch is the small popup that shows you whether a post has been reported or starred and how many times when you visit its detail view. 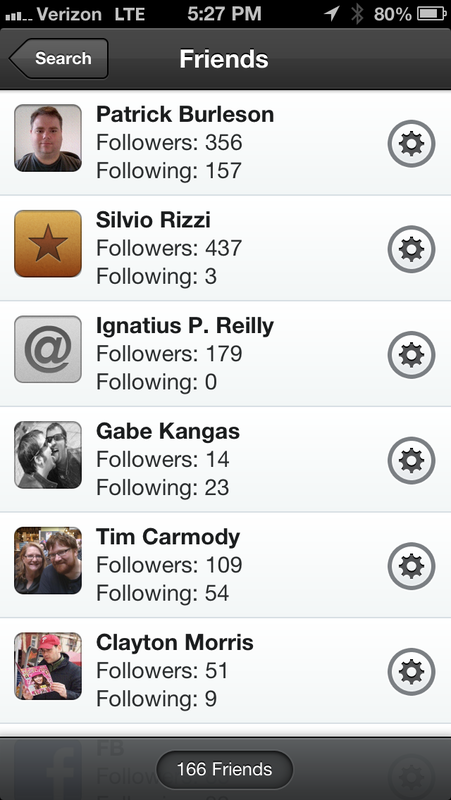 And you can see a list of those who have reposted or starred one of your posts, which is kind of cool. 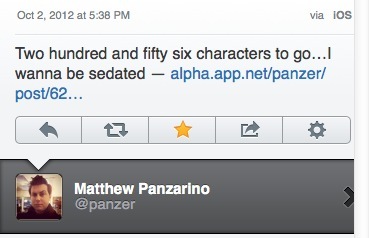 Like a built-in semi-Favstar. The gestures and pop-out drawer actions are all the same as Tweetbot, and allow you to swipe for detail views, tap a link or Avatar in the timeline or tap and hold any of them to get more options. 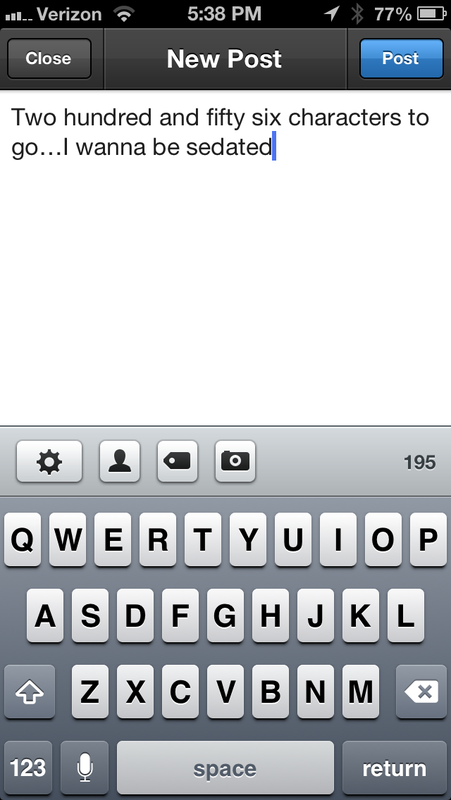 You can also configure a triple-tap to reply, star, repost or translate a post. Swiping right brings you into a conversation and left brings you to the detail view of a post. 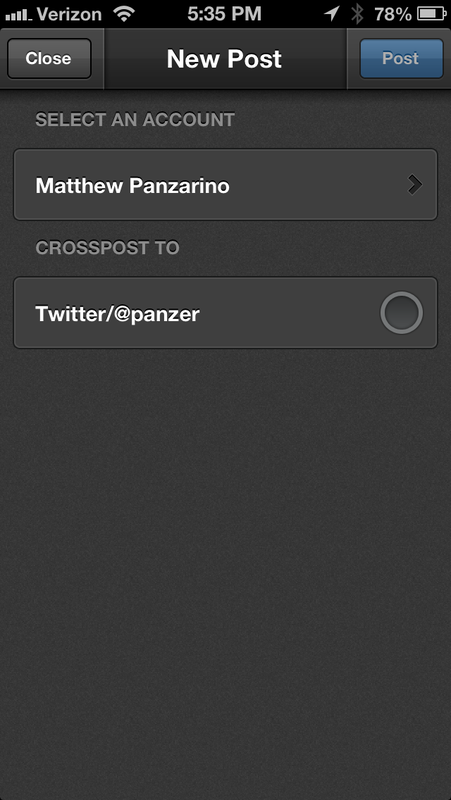 When posting, you can choose to post from multiple accounts by tapping on the header of the post view. When you do, you can also choose to cross-post to Twitter as well. 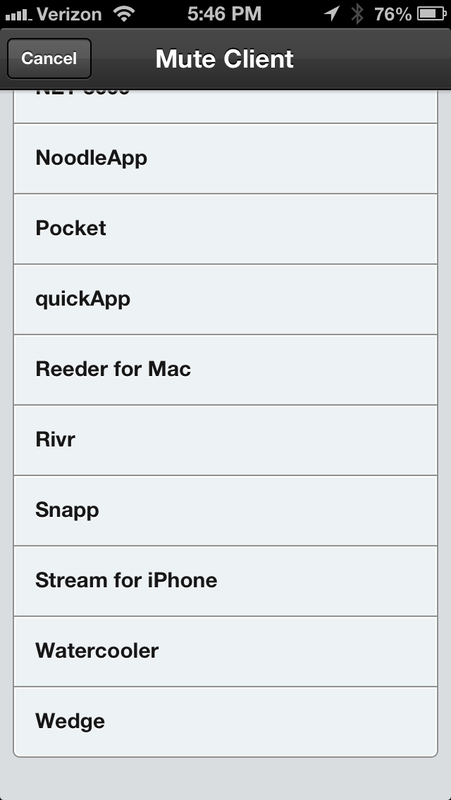 The Twitter posting mechanism uses iOS’ universal sign-on, so you have to have it enabled in Settings.app. When you first launch the app, be sure to hit up the Search pane where you can search App.net for all of your Twitter friends who have profiles on the service too. Reposting works very similar to Tweetbot as well, but you can repost from multiple accounts by tapping and holding the repost button. 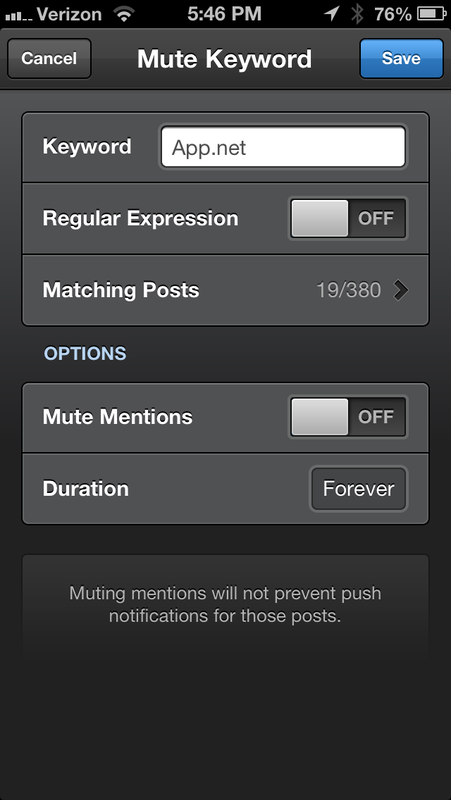 Muting is in, and you can mute either by keyword or by client used to post. Some clients like Rivr post lots of hashtags for annotation features like ‘moods’ and music playing. Until the App.net API gets filtering by annotation support, some folks will appreciate the mute by client. All of the normal posting services are here for media and link shortening as well, aside from Twitter’s image services of course. CloudApp, Mobypicture and Droplr are in for images and video. 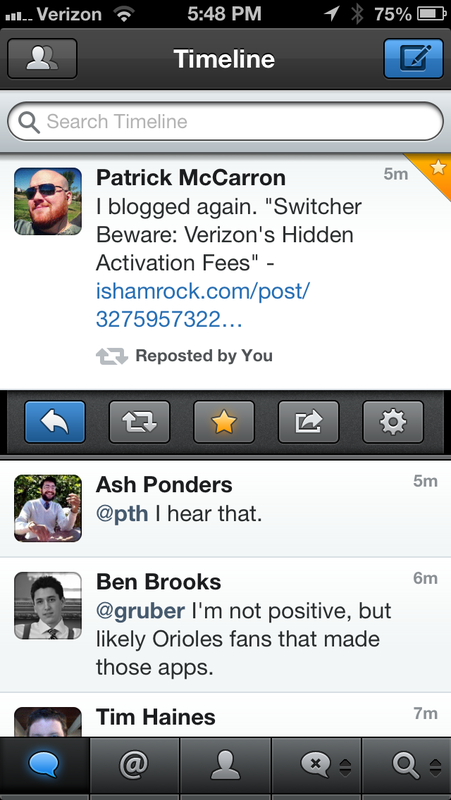 And Instapaper, Pinboard, Readability and Pocket support for Read Later services. There are no push notifications yet in Netbot for iOS, but they’re definitely planned for future versions, Haddad told me. 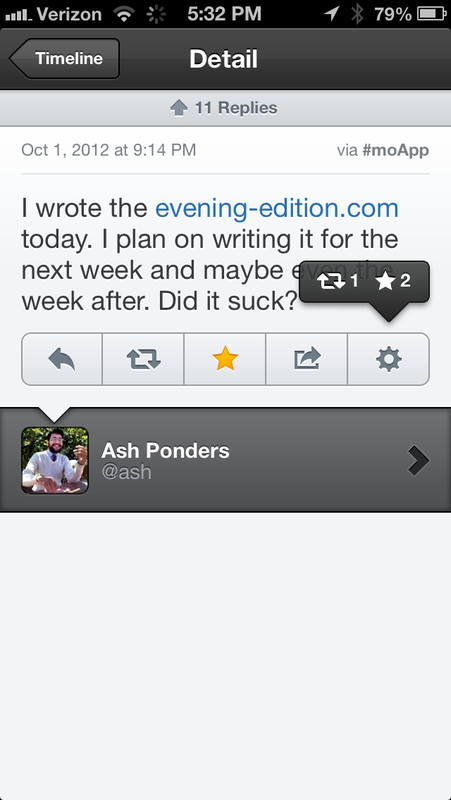 That all depends on when an official addition of push is made to the App.net API, though, so it’s a waiting game. Since the API has been progressing fairly rapidly, I wouldn’t think it would be too long, but there’s no solid timeline yet. Other apps like Rivr are using their own polling system to generate notifications now, if that’s an important factor for you. There is also currently no private messaging built in to the App.net API, but when it’s there, Netbot will implement it. TNW: Why create a client for App.net? Paul: We’re excited about where App.net is heading. 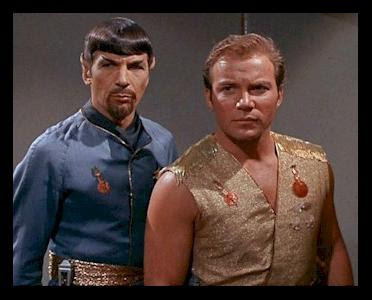 They’ve got a really good team in place and have been making good progress on releasing new APIs. I think as the weeks progress and they get past the basics of a social networking site we’re going to see some really unique opportunities with their architecture. TNW: What has your experience been working with developing an app for the platform? Paul: It’s been overwhelmingly positive. The API is very straightforward and works as expected and the App.net guys have been very helpful in answering questions and adding requested features. Paul: I think its too early to really tell how that program is going to work out, but I think its indicative of the value that App.net puts on its developer ecosystem. 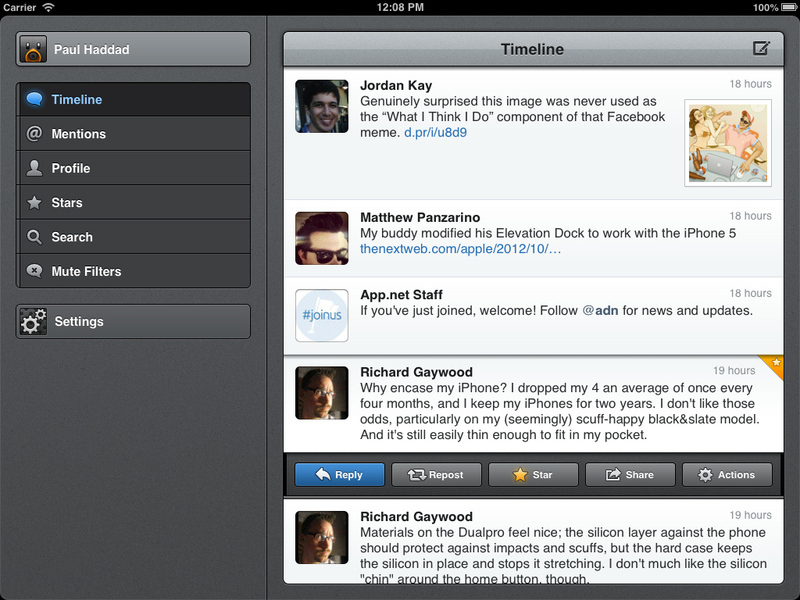 Netbot is available in both iPad and iPhone versions, which are separate purchases, just like Tweetbot.